Increasing multiple drug resistant (MDR) strains of Acinetobacter baumannii has aggravated curiosity in development of alternative therapy. Bacteriophages are often considered as alternative agents for controlling A. baumannii infections. In the present study two lytic phages for MDR A. baumannii were isolated and their efficacy and host ranges were evaluated. The phages were isolated from hospital wastewater. Electron microscopy revealed that IsfAB78 might belong to Myoviridae and IsfAB39 to Podoviridae. Initial characterization of phages showed that they have narrow host range and failed to infect relative and non- relative bacteria. Both phages decreased the A. baumannii turbidity significantly, indicating that these isolated phages may be considered as candidates for phage therapy. The emergence of multidrug-resistant (MDRs) pathogens has created serious problem in treatment of infections . Acinetobacter baumannii is one of the most important opportunistic pathogen in the hospital acquired infections especially, in intensive care units (ICUs) . These bacteria can be easily isolated from water, soil, and hospital facilities. A. baumannii found on human skin and mucous membrane, is responsible for opportunistic infections including bacteremia, pneumonia, meningitis, urinary tract infections, and surgical wounds in immune- compromised patients . This pathogen has intrinsic drug resistant mechanisms and is capable of acquiring these elements . In recent years, MDR A. baumannii has become a serious problem in hospital acquired infections , . Prior to the discovery and widespread use of antibiotics, it had been suggested that bacterial infections could be prevented by bacteriophages . Bacteriophages (phages) are abundant in environment and invade bacteria as their specific host . Phage therapy is a complement or an alternative system to compensate chemotherapy. High selectivity and specificity of bacteriophages permits targeting of specific pathogens, without affecting desirable bacterial flora which means that phages are unlikely to affect the “colonization pressure” of the patients. Thus, phage therapy could be natural, less harmful, and effective in eliminating bacterial infections ,. In this study, we isolated and identified lytic phages from hospital wastewater. Two isolated phages were partially characterized and used to examine host susceptibility on 43 MDR A. baumannii clinical isolates. We report the potential of phages as suitable candidate for phage therapy. During the course of study (2012-2013), 350 samples including catheter, blood, urine, wound, CSF, sputum, and eye swabs were collected from ICUs of Isfahan Medical University hospitals. Specimens were inoculated initially on blood and MacConkey agar (Merck) and incubated for 24 h at 37°C. Conventional biochemical methods such as oxidase, citrate, urease, malonate consumption, oxidation and fermentation of sugars, motility and indole production were used to identify A. baumannii . Molecular identification of bacterial isolates was confirmed by amplification of the blaOXA-51 gene. DNA of the isolates was extracted by DNA extraction kit (Fermentas, USA) according to the manufacturer's protocol. DNA concentration and purity was measured using a spectrophotometer. The primer sets F: 5'- TAA TGG TTT GAT CGGCCTTG - 3'and R: 5' - TGGATTGCACTTCATCTTGG -3' were used to amplify blaOXA-51 ,. PCR was carried out in 25 μL master mix, including: MgCl2 (2 mM), dNTP (2 mM), primer (500 nM), template DNA (10-100 ng), Taq polymerase (1 unit) , in DNA thermal cycler (Master Cycle Gradient, Eppendrof, Germany) with initial denaturation at 94°C for 5 min, followed by 30 cycles at 94°C for 25 s, 53°C for 40 s, 72°C for 50 s, and one cycle of final extension at 72°C for 6 min . PCR products were separated by electrophoresis of amplicons on agarose gel (1.5%) and visualized by staining with green viewer under UV light. Pseudomonas aeruginosa ATCC 27853 and A. baumannii ATCC 19606 strains were used as negative and positive control, respectively. Agar disc diffusion test was performed with amikacin, tetracycline, ceftazidime, and carbapenem (imipenem and meropenem), trimethoprim sulfametoxazol, ampicillin- sulbactam, ciprofloxacin (Rosco, Denmark) to evaluate susceptibility of A. baumannii isolates. Inhibition of bacterial growth was measured and compared to the reference tables provided by CLSI (Clinical and Laboratory Standard Institute) . Statistical analysis was performed by SPSS software version 14, using chi-square test and kappa coefficient. P values < 0.05 were considered as an indicator of significance. Water samples including hospital wastewater, Karun River, Caspian Sea, Persian Gulf and fishpond were preincubated with the host A. baumannii for enrichment phages present in the water samples. The water samples were centrifuged at 4000 rpm for 10 min and the supernatants were filtered through 0.45 μm pore size membrane. The phages were amplified by mixing 50 mL of filtered supernatant with equal volume of 2× nutrient broth medium (containing 5 mM MgSO4). One mL of 24-h cultures of MDR A. baumannii (equal to 0.5 McFarland) was added to the mixture. The samples were incubated overnight a t 30°C with shaking at 160 rpm. Next, several drops of chloroform were added to the cultures and shaken for additional 10-15 min to kill the bacteria. The mixture was centrifuged at 10,000 rpm for 15 min. The supernatant was filtered through 0.45 μm membrane filter . In order to detect phages, the double-layer agar (DLA) technique was used. 200 μL of filtered samples were mixed with 2.5 mL of nutrient agar (0.7% agar) in the presence of 0.1 mL of log-phase indicator strain. Then, the mixture was transferred to the solid medium of 1.5% nutrient agar and incubated at 37°C for 24 h . Single plaque was picked. The plaque purified phage was added to the bacterial culture (106 CFU/mL) in 50 mL nutrient broth and shaken for additional 24 h. The mixture was centrifuged at 14000 rpm for 10 min, and the supernatant was filtered through 0.45 μm filter. This method was repeated several times in order to produce high amount of purified phage. The titer of phage was determined by plaque assay . 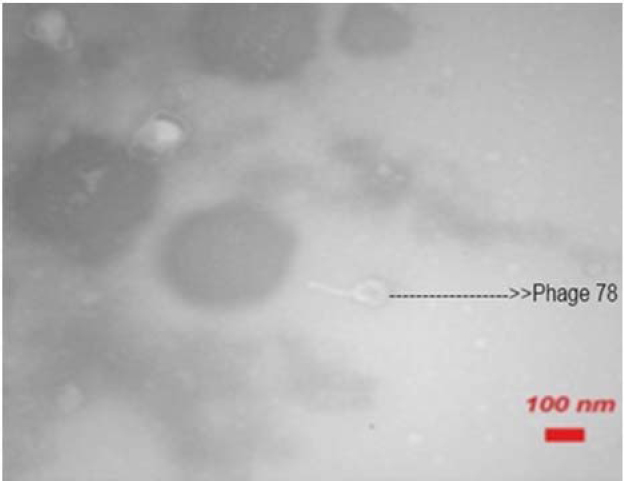 In order to study morphology of phages, 1 mL of prepared phage was precipitated with polyethylene glycol 6000 . The samples were stained with 2% uranyl acetate for 30 s and observed in Zeiss 900 transmission electron microscope at 80 kV . In order to study the host range, spot assay was performed. 100 µL of each MDR A. baumannii isolates was mixed with 2.5 mL of 0.7% melted nutrient agar and poured on agar plates. When agar of the upper layer was solidified, 5 µL of phage was spotted onto each bacterial lawn and left to dry. Plates were incubated at 37°C overnight . In order to check the polyvalence activity of the phages, host spectrum of phages was examined by spot test on number of bacterial strains including Pseudomonas aeruginosa, Echerchia coli, Klebsiella pneumoniae, Staphylococcus aureus, Enterococcus faecalis, and other Acinetobacter spp, as explained above ,. For this assay, 1 mL of overnight MDR A. baumannii bacterial culture was inoculated to three separated flasks containing 100 mL nutrient agar. Two flasks were inoculated with two isolated phages and the third one was taken as negative control (having no phages). The flasks were incubated in 37°C while shaking at 160 rpm. The optical density (OD 600) of samples was measured at 20 min intervals for 4 h .
Among 350 samples obtained from ICUs of Isfahan Hospitals, 43 A. baumannii were identified by the phenotypic methods. The isolates confirmed as Acinetobacter by PCR. All isolates harbored the blaoxa-51 gene. [Figure 1] shows the results of blaoxa-5' amplification. Figure 1: PCR amplification of blaoxa-51 gene. Lane 1, size marker 50 bp ladder; lane 2, negative control Pseudomonas aeruginosa ATCC 27853; lane 3, positive control Acinetobacter baumannii ATCC 19606; and lanes 4-7, clinical isolates show bands of amplified DNA at 353 bp. Agar disc diffusion assay showed that 53.5% of the isolates were resistant to amikacin, 83.7% to tetracycline, 86% to ceftazidime, 90.7% to trimethoprim sulfametoxazole, 93% to cefepime, imipenem, meropenem, and ampicillin-sulbactam. All of isolates were resistant to ciprofloxacin. The present study showed a high percentage (100%) of multidrug resistant A. baumannii in clinical isolates [Figure 2]. 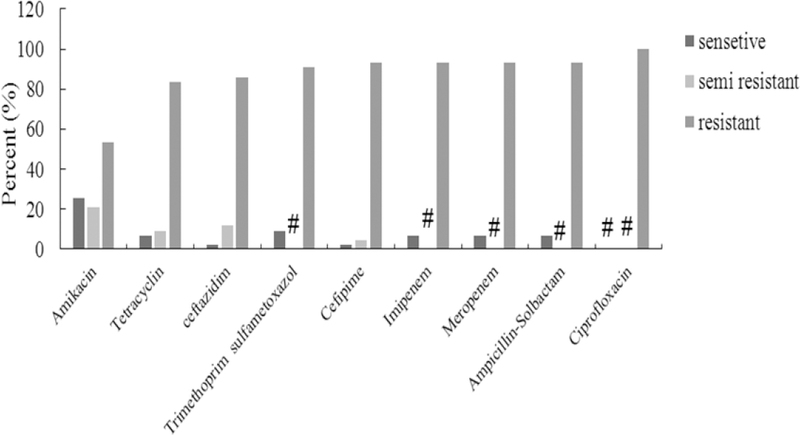 Figure 2: Antimicrobial susceptibilities of 43 Acinetobacter baumannii clinical isolates from ICU to 9 antimicrobial agents, # represents the zero percent. Two lytic phages were isolated from hospital wastewater. Among MDR A. baumannii isolates, AB39 and AB78 served as indicators in the initial screening. Both phages formed clear plaques on the bacterial lawns, indicating lytic property of both phages [Figure 3]. 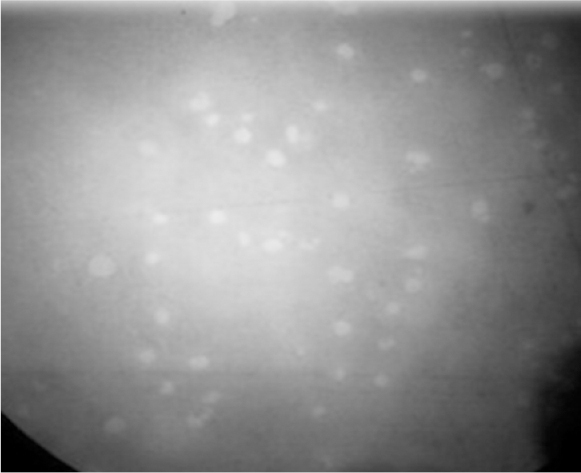 Figure 3: Optical microscope image of phage plaques on bacterial lawn. The electron microscope images indicated that phage IsfAB39 has a 50 nm head with six- sided symmetry and a short tail, similar to the Podoviridae family [Figure 4]. IsfAB78 has an approximately 100 nm long, six-sided symmetry and can be classified as Myoviridae [Figure 5]. Figure 4: Electron microscope picture of the phage IsfAB78. 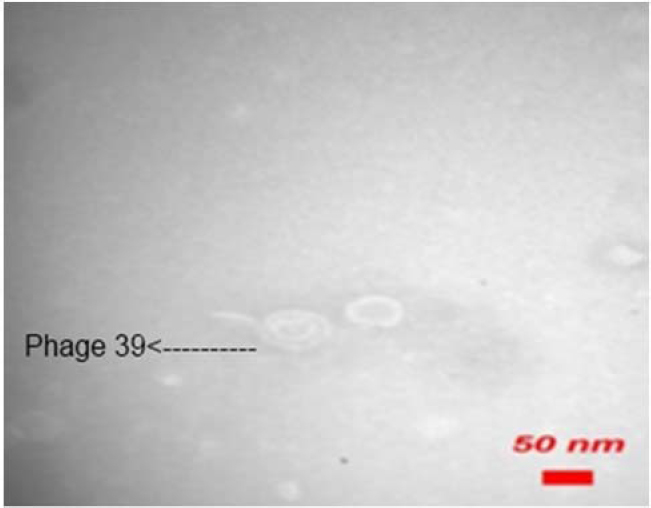 Figure 5: Electron microscope picture of the phage IsfAB39. Both isolated phages were studied to determine the host spectrum. Also, the sensitivity of each phage was evaluated against MDR A. baumannii isolates. Among 43 MDR A. baumannii isolates, 11 (25.6%) and 12 (27.9%) isolates showed sensitivity to phages IsfAB39 and IsfAB78, respectively [Table 1]. Table 1: The host spectrum of phages IsfAB39 and IsfAB78 on Acinetobacter baumannii isolated in ICU. In order to determine the host range of both phages, the sensitivity of IsfAB39 and IsfAB78 on related and non-related bacteria were examined [Table 2]. 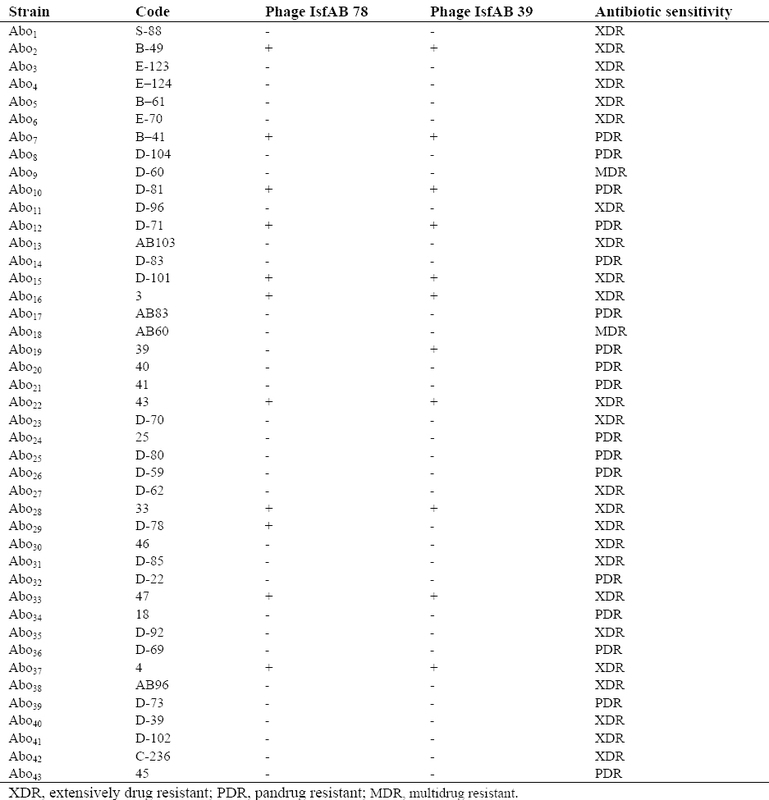 Table 2: Results of studying the host spectrum of phages 39 and 78 on other bacteria. Acinetobacter lwoffii, Pseudomonas aeruginosa, Echerchia coli, Klebsiella pneumoniae, Staphylococcus aureus and Enterococcus faecalis, did not show sensitivity to the phages. Both phages decreased the A. baumannii turbidity significantly [Figure 6]. Figure 6: Bacterial reduction experiment. 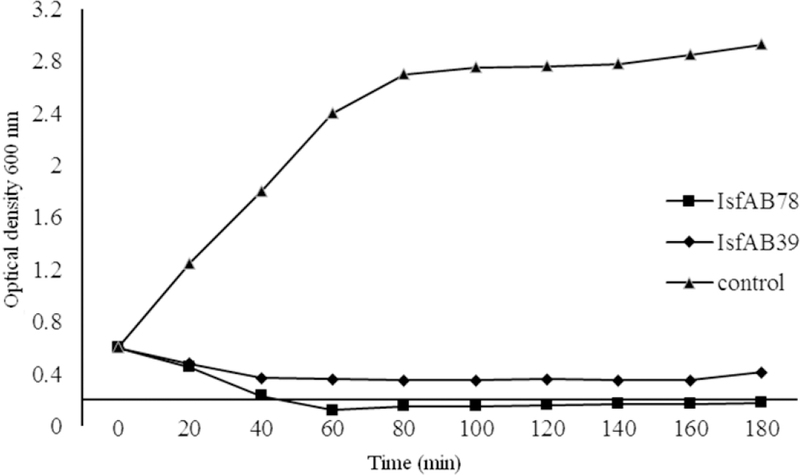 Effect of IsfAB78 and IsfAB39 on growth of Acinetobacter baumanii compared with the control. Due to increase in the number of drug resistant pathogenic bacteria, phage therapy is considered as alternative therapeutic method to treat bacterial infections ,. Recently, extensive studies on phage therapy have been done . Narrow host range and host specificity of phages limit their application in clinical and commercial fields. To overcome obstacles, further screening of lytic phages, application phages cocktails, and combination of them with antibiotics should be investigated . Therefore, it is important to isolate and characterize more sensitive and suitable phages to improve the quality of phage therapy . In this research, we isolated MDR A. baumannii lytic phages with the aim of using them in treatment and diagnosis. Phages can be found in places that bacteria are living . Acinetobacter species are organisms that can be easily isolated from non-clinical resources such as soil, surfaces, drinking water, wastewater and different foods . Therefore, phages specific to Acinetobacter genus can be easily isolated from nature. Recently, 10 phages have been isolated from wastewater using 125 clinical isolates of A. baumannii as indicator hosts . These phages were determined AB1 − AB9 and AB11. Electron microscopy examination suggested that phages AB1-7 and AB9 were belong to the Podoviridae family and phages AB8 and AB11 to the Myoviridae family . In another study, the phage ZZ1, specific to A. baumanii, was isolated from fishpond water. Ability of this phage to form clear plaques in the ABO9V implied lytic nature of ZZ1. Morphologically, ZZ1 had characteristics similar to the Myoviridae family . In our study, phages IsfAB39 and IsfAB78, were isolated from hospital wastewater. Examination by transmission electron microscopy showed that the phage IsfAB78 might belong to the Myoviridae and the phage IsfAB39 to the Podoviridae family. Both phages were able to form clear pinpointed plaques on AB39 and AB78 lawns, indicative of lytic activity of phages, which are in accordance with other investigations , . The sensitivity of phages against A. baumannii clinical isolates were investigated. About 27% of clinical isolates lysed by isolated phages. A. baumannii phages have narrow host range , . Phage Abp53 lysed 27% of A. baumannii isolates . This result agrees with our findings. Interestingly, some isolates showed different sensitivity to the phages, suggesting use of phage cocktails for therapeutic purposes. However, different antibacterial activity based on phage concentration and resistance mechanism, coinfection of phages on single isolates, needs to be determined. AP22 phage lysed 68% of A. baumannii strains by forming a clear plaque. This phage tested against other species of Acinetobacter (A. lwoffii, A. calcoaceticus, and A. anitratus) and also against some gram-negative bacteria. All of tested bacteria were not sensitive to this phage. The AP22 bacteriophage was belong to the Myoviridae family . In this study, we evaluated host specificity of both phages on other related and non- related bacteria by spot method. A. lwoffii and mentioned gram-positive and gram-negative bacteria did not show sensitivity to the two phages indicating low host spectrum. A sharp decline in A. baumannii culture was seen after 20-40 min incubation with phages. A slow increase in turbidity of medium was seen after 24 h. This might be due to appearance of rapid resistant bacterium to phage infection. These tolerating bacteria may start to grow and increase the optical density of the culture. This behaviour of phages is a downside in phage therapy . In this study two potent lytic phages against MDR A. baumannii were isolated. Although more details examining the effect of the phages will need before using them in phage therapy, we hope this study will provide more opened insight on treating MDR infections by phages. We would like to appreciate the personnel of the Alzahra Hospital Laboratory. We are also thankful to Mrs. Nafiseh Hosseini, Microbiology Lab, Faculty of Medicine, Isfahan University of Medical Sciences for her technical support and providing bacterial strains. Perez F, Hujer AM, Hujer KM, Decker BK, Rather PN,Bonomo RA. Global challenge of multidrug − resistunat Acinetobacter baumannii. Antimicrob Agent Chemother. 2007,51(10):3471-3348. Barbolla RE, Centron D, Maimones, Rospide F, Salgueila C, Altclas J, et al. Molecular epidemiology of Acinetobacter baumannii spread in an adult intensive care unit under an endemic setting. Am J Infect Control. 2008;36(6):444-452. Fagon JY, Chastre J, Domart Y, Trouillet JL, Gibert C. Mortality due to ventilator-associated pneumonia or colonization with Pseudomonas or Acinetobacter species: assessment by quantitative culture of samples obtained by a protected specimen brush. Clin Infect Dis. 1996;23(3):538-542. Dijkshoorn L, Van Vianen W, Degener JE, Michel MF. Typing of Acinetobacter calcoaceticus strains isolated from hospital patients by cell envelope protein profiles. Epidemiol Infect. 1987;99:659-667. Joly-Guillou ML. Clinical impact and pathogenicity of Acinetobacter. Clin Microbiol Infect. 2005;11:868-873. Sulakvelidze A, Alavidze Z, Morris JG Jr. Bacteriophage therapy. Antimicrob Agents Chemother. 2001;45(3):649-659. McGrath S and van Sinderen D, (editors). bacteriophage: genetics and molecular biology (1st Ed.). Caister Academic Press. 2001. ISBN: 978-1-904455-14-1.
van Helvoor T. Bacteriological and physiological research styles in the early controversy on the nature of the bacteriophage phenomenon. Med Hist. 1992;3:243-270. Clark JR, March JB. Bacteriophages and biotechnology: vaccines, gene therapy and antibacterial. TrendsBiotechnol. 2006; 24(5):212-218. Forbes BA, Sahm DF, Weissfeld AS. Baily and Scott's diagnostic microbiology. 12th ed. Mosby Elsevier. Texas. 2007;pp: 334-339. Turton JF, Woodford N, Glover J, Yard S, Kaufman ME, Pitt TL. Idenfication of Acinetobacter baumannii by detection of the blaoxa51 carbapenemase gene intrinsic to this species. J Clin Microbiol. 2006;44(8):2974-2976. Woodford N, Ellington MJ, Coelho JM, Turton JF, Ward ME, Brown S, et al. 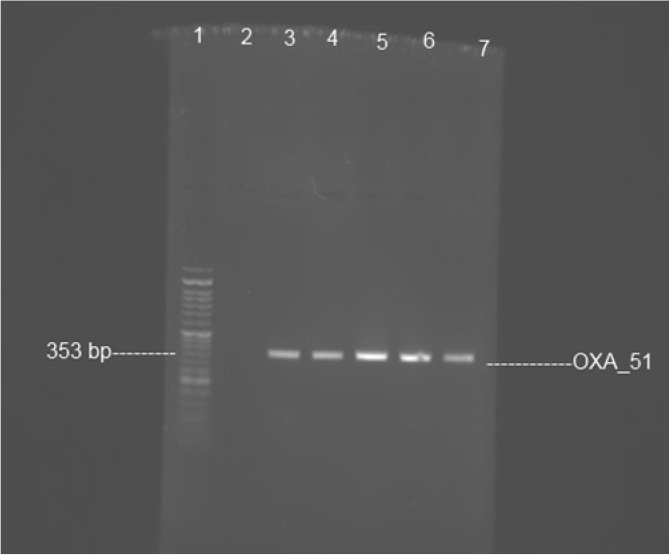 Multiplex PCR for genes encoding prevalent OXA carbapenemases in Acinetobacter spp. Inter J Antimicrob Agents. 2006;27:351-353. Morovat T, Bahram F, Mohammad E, Setareh S, Mehdi FM. Distribution of different carbapenem resistant clones of Acinetobacter baumannii in Tehran Hospitals. New Microbiologica. 2009;32:265-271. Clinical laboratory standards institute (CLSI). Performance standards for antimicrobial susceptibility testing: twentieth informational supplement: M100-S20. Clinical laboratory standards institute, Wayne PA: USA. 2012. Lin NT, Chiou PY, Chang KC, Chen LK, Lai MJ: Isolation and characterization of phi AB2: a novel bacteriophage of Acinetobacter baumannii. Res Microbiol. 2010;161:308–314. Jin J, Li ZJ, Wang SW, Wang SM, Wang SM, et al. Isolation and characterization of ZZ1, a novel lytic phage that infects Acinetobacter baumannii clinical isolates. BMC Microbiol. 2012;12:156. Haq I, Chaudhry WN, Andleeb S, Qadri I. Isolation and partial characterization of a virulent bacteriophage IHQ1 specific for Aeromonas punctata from stream water. Microb Ecol. 2012;63:954-963. Barrow PA, Soothill JS. Bacteriophage therapy and prophylaxis: Rediscovery and renewed assessment of potential. Trends Microbiol. 1997,5:268-271. Carlton RM. Phage therapy: Past history and future prospects. Arch Immunol Ther Exp. 1999;47:267–274. Ackermann HW, Brochu G, Konjin HPE: Classification of Acinetobacter phages. Arch Virol. 1994; 135(3-4):345–354. Soothill JS: Treatment of experimental infections of mice with bacteriophages. J Med Microbiol. 1992;37:258–261. Chibani- Chenoufi S, Bruttin A, Dillmann ML, Brussow H. Phage- host interaction: an ecological perspective. J Bacteriol. 2004;186:3677–3886. Bergogone Berezin E, Towner KJ. Acinetobacter spp, as nosocomial pathogens: Microbiological, clinical, and epidemiological features. Clin Microbiol Rev. 1996;9(2):148–165. Yang HJ, Liang L, Lin SX, Jia SR. Isolation and characterization of a virulent bacteriophage AB1 of Acinetobacter Baumanii. BMC Microbiol. 2010;10:131. Yele AB, Thawal ND, Sahu PK, Chopade BA. Novel lytic bacteriophage AB7-IBB1 of Acinetobacter baumannii: isolation, characterization and its effect on biofilm. Arc Virol. 2012;157(8):1441-1450. Lee CN, Tseng TT, Lin JW, Fu YC, Weng SF, Tseng YH. Lytic myophage Abp53 encodes several proteins similar to those encoded by host Acinetobacter baumanii and phage phiKO2. Appl Environ Microbiol. 2011;77(19):6755-6762. Popova AV, Miakinina VP, Platonov ME, Volozhantsev NV. Molecular characterization of the multidrug-resistant Acinetobacter baumannii strains and assessment of their sensitivity to the phage AP22. Mol Gen MikrobiolVirusol. 2012;4:18-22.